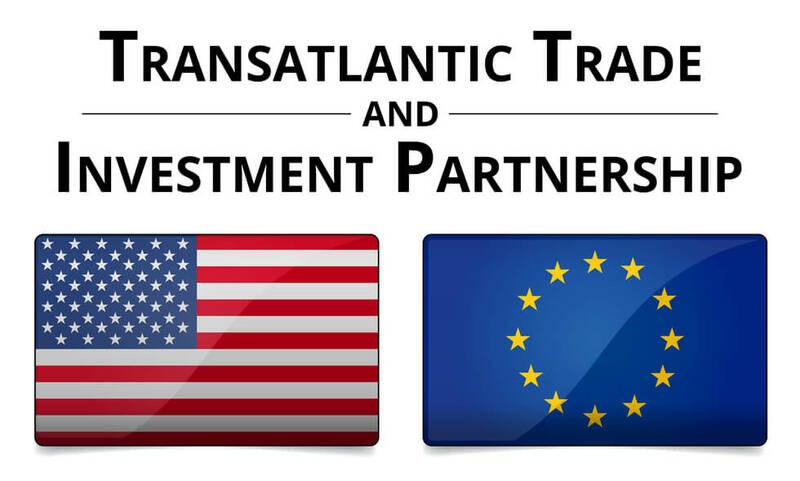 The North American Meat Institute, which represents nearly all meat and poultry producers in the U.S., appears eager to see the The Transatlantic Trade and Investment Partnership (TTIP) solidified. And yet it’s precisely this enthusiastic embrace of the trade agreement—and what it means for the continued proliferation of American meat and the practices used to create it—that worries critics of the TTIP. According to a new report from the Institute for Agriculture and Trade Policy (IATP), a non-profit that works to promote sustainable food, farming, and trade systems, the trade agreement is likely to expand factory faming and corporate control of meat and livestock production. In doing so, the group believes it could undermine existing local animal welfare and food labeling laws. And they fear it could also threaten how the environmental impacts of meat and dairy production are regulated while potentially making it difficult to improve the low wages and dangerous working conditions in the meat processing industry. “It will be a race to the bottom,” IATP advisor and report co-author Sharon Treat told Civil Eats. While TTIP policies apply to all sorts of products, the global commerce it encourages could have a particularly insidious affect on meat, according to the IATP. The U.S. system of large, industrial animal farming has led to an international market “dominated by ever fewer and larger transnational food and agricultural corporations,” says the new report. While this system has created low prices for consumers, it comes with enormous environmental and societal costs. Among these, the report states, are “untenable use of natural resources, reduced biodiversity, significant greenhouse gas emissions, animal cruelty, destruction of local economies, horrendous working conditions, and health risks to consumers.” The new trade agreement would likely “institutionalize” these systems further, said Treat. 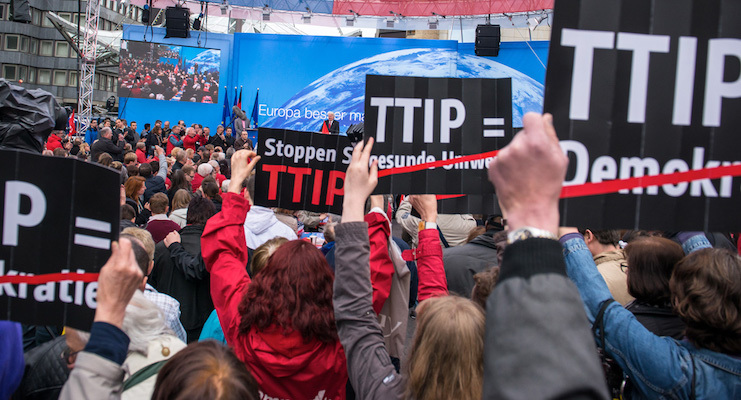 But the key features of the trade agreement, which TTIP proponents say will benefit consumers and businesses—lowering taxes on imports and exports and “harmonizing” regulations between the U.S. and EU—are the same factors that critics like the IATP say will lower standards. Cheaper Imports, More Factory Farms? “The only way to win in the marketplace—or in the supermarket—is to make your product cheaper than the next guy’s,” and that often means “by moving to cheaper production costs,” Treat explained. Where meat production is concerned, IATP fears that this will mean a global shift toward the U.S. style of factory farming. These industrial-scale feedlots and dairies, which are not yet as widespread in Europe as they are in the U.S., could widen the gulf between conventional meat and local, organic, and pasture-raised meat (which already is often twice as expensive). “We have a U.S. system based on antibiotics, chemicals like chlorine and ractopomine, abusing the environment, and abusing workers to come up with cheaper products. If you lower tariffs, it makes it difficult for any agricultural producer trying to do it differently,” said Treat. IATP points out the that U.S. is currently the world’s largest beef and poultry producer and the world’s largest exporter of pork. U.S. beef feedlots can hold as many as 18,000 head of cattle, while a European feedlot with 200 is considered large. And over the past two decades, similar trends have been seen in chicken and dairy operations. The upshot is that the meat and dairy industries are now dominated by international corporations that control increasingly large shares of the market not only in the U.S. and Europe, but also in Asia and Latin America. 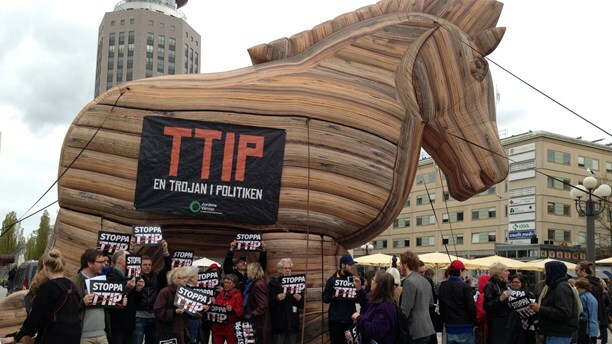 International trade agreements like the TTIP encourage these trends, says IATP. “We can document that foreign investment is increasing factory farming here,” said Socially Responsible Agriculture Project chief executive officer Kendra Kimbirauskas, “These companies are looking at potential markets opening up and producing products for the export market,” she explained. And she adds, “Our rural communities are the ones suffering from the externalities,” the environmental and social impacts of these operations. Regulatory “Harmonization” and Lower Standards? In addition to lowering tariffs, TTIP would “harmonize” or standardize regulations across the countries involved in the agreement. 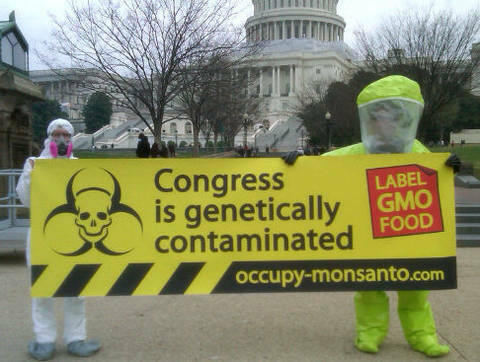 This is being done because regulations (such as the labeling of genetically modified food or laws prohibiting certain food additives) often keep one country’s product out of another country. In the case of meat, says IATP, harmonization may well mean weakening and lowering animal welfare standards where they exist. For example, European consumers are concerned about “chlorine chicken and hormone beef coming in from the U.S.,” said Shefali Sharma, director of IATP’s agricultural commodities and globalization initiatives and the report’s co-author. She’s referring to the practices of feeding livestock drugs used to enhance growth and washing chicken in chlorine baths to kill pathogens—both practices not allowed in the EU. 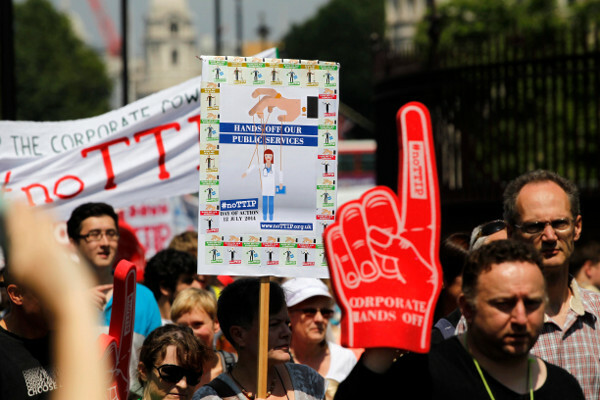 There’s also concern that the TTIP won’t impose strong enough curbs on antibiotic use in livestock, a practice that has been linked to the spread of antibiotic-resistant bacteria. And for U.S. consumers, TTIP’s “regulatory harmonization” could interfere with state standards, says Treat, who contends that state laws could all be placed in jeopardy by TTIP, including California’s requiring cage-free egg production, several state-level labeling laws aimed at distinguishing farmed from wild fish and to prevent fish “fraud,” Alaska’s law that requires labeling of genetically engineered fish, and Vermont’s GMO-labeling bill. And she points to the fact that U.S. country-of-origin labeling for meat, has already been declared in violation of international trade rule. “Local procurement—policies that specify buying local food—could be affected,” saidFood and Water Watch assistant director Patty Lovera. She also points out that in the EU, animals can be treated with antibiotics and their meat still sold as organic. This is not the case in the U.S. The TTIP could potentially affect this regulation, said Lovera. The TTIP also includes provisions that allow countries and businesses to challenge new regulations they think would adversely affect profits by blocking trade. Other provisions would require justifying costs of regulations and enable industry groups to use science that’s not publicly available in these analyses. This could also impact future regulations on practices like cloning and genetically engineered meat, says IATP. “For American consumers, our efforts to try to do things like labeling food or addressing agriculture’s environmental impacts”—or improving labor conditions in meat production—“these will be immeasurably more difficult to do,” Treat explains. 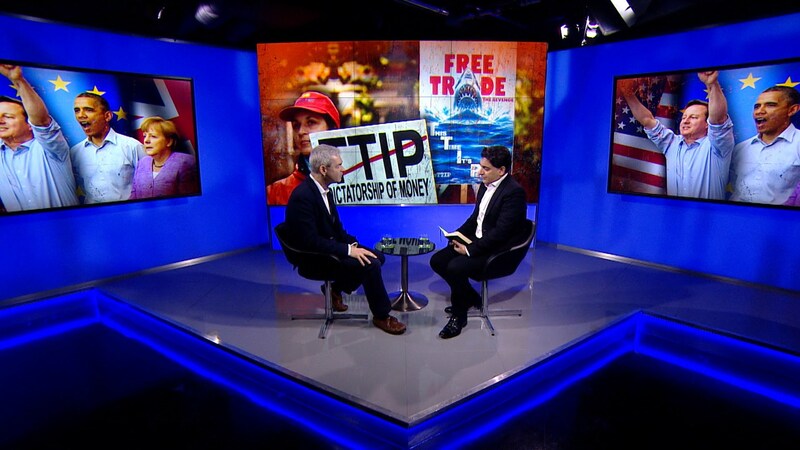 In “places like Maine, which is working to support local sustainable agriculture” with food sovereignty laws, “TTIP will make it difficult to shift away from the industrial model,” adds the former Maine state legislator. What’s more, says IATP, this provision of the trade agreement could also jeopardize individual states’—and countries’—ability to regulate the environmental impacts of meat and livestock production. This would include regulation of greenhouse gasses, includingmethane and nitrogen, and pollutants like phosphorus, which are closely associated with livestock production. TTIP provisions would increase large corporations’ ability to control market standards, including those for meat, explains Shefali. This is in part because the trade agreement negotiations are closed to many, including U.S. Congressional representatives as well as lawmakers working at the state level. Meanwhile, other stakeholders such as NGOs, consumer, and environmental and labor groups are only allowed to make five minute presentation during limited “stakeholder engagement events.” But it’s an open secret that corporate lobbying has a great influence on the process. And agribusiness is one of the biggest lobbies of all. At the same time, a US Department of Agriculture analysis of the TTIP found that the agreement would increase US food exports. These sales, according to USDA, could be worth hundreds of millions of dollars annually—and for pork more than $2 billion. IATP notes that all of this is happening at a time when a growing number of consumers are demanding more transparency in the search for locally produced, minimally processed meat and other foods—as well as clear, easy-to-access information about ingredients and sourcing. “No public good is going to be served by moving policy decisions behind closed doors,” says Treat.